This page encompasses a variety of boats, those shown on this page are some of my favorites which have yet to be built. Should you desire more information on any of these boats please contact us we would love the opportunity to work with you to make one of these or a custom boat a reality for you. 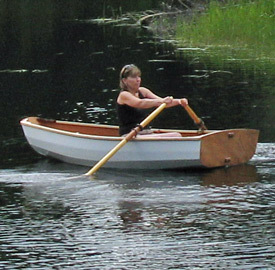 This dingy is based on the Norwegian style of pram and is suitable for rowing, sailing and powering with a small outboard motor. Displacement @ 5" (13cm.) draft 325lbs. 147kg. Sail area: 35 sq. ft. 3.25m. sq. This design was started in response to some inquiries we have had looking for a larger version of the Rondane 8, as with all the designs we have in their preliminary stages, with a potential builder who is serious about the projectwe would be happy to complete the work. 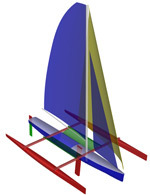 Sail Area: 75 sq. ft 6.97m. sq. 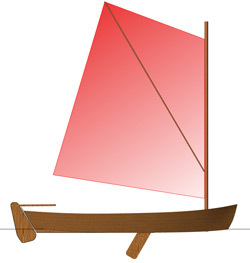 At the same that the drawing was done for the boat above we did one for a simple skiff. 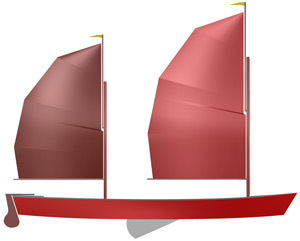 Sail Area 70sq. ft. 6.53m. sq. This design was developed as a family day boat that offers enough performance to keep those members of the family who want a more sporty boat happy but manageable and comfortable for everyone to enjoy. 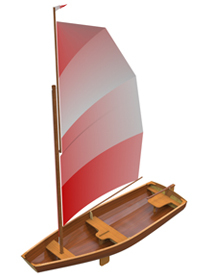 We also made the decision to stick with simple stitch & glue construction putting the option of building this boat within the reach of more potential boat builders/sailors. This boat is well on in the design process to the point that we have even had the cost of a kit priced out. Sail Area: 180ft. sq. 16.7m. sq. The trimaran that we are working on can be disassembled for transport with each component part not weighing more than a kayak, this will enable you to disassemble the boat, load it on the car top and get it to the water. We are aiming to keep the boat as simple as possible for the building process as well as transport and use. Designed Displacement: 700lbs. 13m. sq. Sail area: 140sq. ft. 13m. sq.